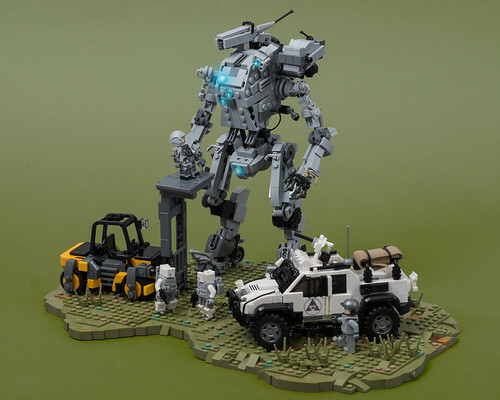 4th and for now final Titanfall-vignette. For this build I wanted to use the very first Titan I designed, the Stryder-class from the first Titanfall game. This little diorama is a bit different from the others, because it is not directly based on a multiplayer map. Instead, it is inspired by the concept art for Titanfall's third DLC "IMC Rising". In addition to the forklift, I also included the Gremlin, which I designed last year. As I said this is for now the final Titanfall-vignette. I really enjoyed making them, but they require a lot of different coloured parts. So I am not sure how long it will take me to collect enough to build dioramas for the remaining Titans.